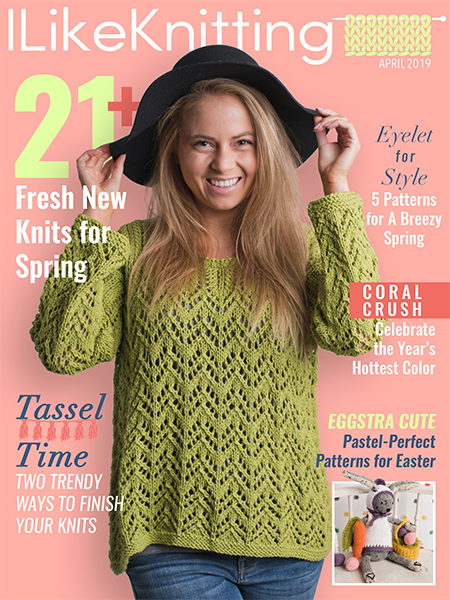 Find knitting afghan patterns, including knit ripple afghans, granny square knit afghans and more. This beautiful afghan is worked in different colored blocks in the garter stitch. The joining of the blocks creates the eye-pleasing effect of this lovely design. Since each block is worked separately, it is a perfect project for on the go. Inspired by the colors of the desert and geometric shapes, this beautiful throw is the perfect accessory for at home or on the go. Wrap up on chilly nights or sit on the grass and have a picnic. Using basic colorwork skills and knit back and forth, this pattern is sure to be a fun knit. Short rows and creative increasing and decreasing combine forces to create an adorable heart-shaped baby blanket. Looking at this design, you’d think cabling would be involved, but there’s not a one in this pattern. Try out a new technique using slipped stitches in this couch or lap-sized blanket. This piece is worked in a bulky weight washable yarn, making it easy to care for and a quick project! 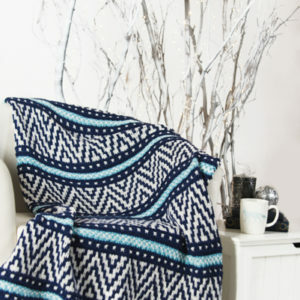 This woven-look throw is guaranteed to cure your winter blues. Channel a southwestern style with this bold afghan. 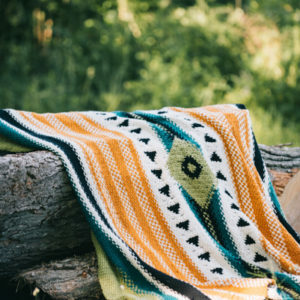 Treat yourself to a single-panel afghan that emulates traditional desert design while you learn to work up this clever combination of linen stitch, stranded colorwork, slipped stitches and a dash of intarsia. Get ready to fall head over fins in love with this gorgeous blanket. 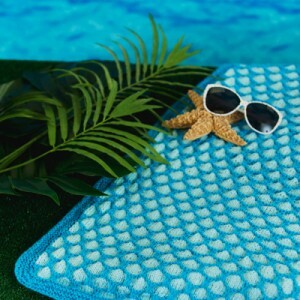 Its blue color scheme and textured stitching reminds us of vibrant mermaid scales and would be the perfect addition to a picnic on the beach. 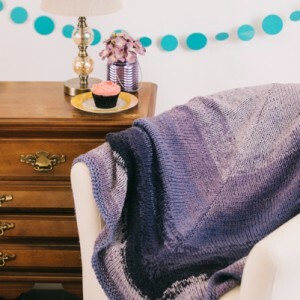 This cozy afghan uses lovely purple yarn cakes to create a pentagon-shaped design. Knit in five sections for easier handling when you knit on the road, the sections are blocked and sewn together using a single crochet seam on the back. Shaping is minimal, which makes this the perfect knit for a social evening out with your knitting buddies. 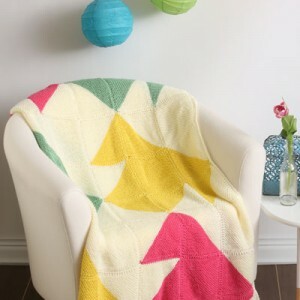 The blanket is comprised of four rectangles, each bisected into a black and a white triangle, created by a simple intarsia technique. Using increases and decreases along the diagonal, you get a nice smooth line at the color change. The blanket is worked in two pieces for ease of handling, and these are sewn together at the end. It’s knit in a cozy bulky weight yarn for the maximum in warmth. This throw is inspired by the twisted lines and spirals of wrought iron ornamental work often found in garden gates. 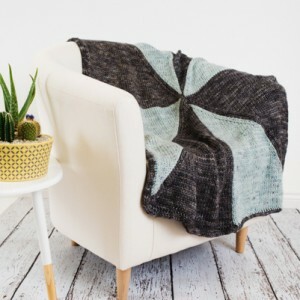 Knit in one piece with a moss stitch border, cables galore, and in a super soft yarn, this is the throw you’ll enjoy spending time on.